Don Murray, of Lawrence, views some of his Southdown sheep. Southdown sheep might be a breed steeped in history — it is the oldest of the terminal sire breeds in the UK — but a group of breeders in New Zealand is firmly focused on positioning it for the future, as Sally Rae reports. Lawrence farmer Don Murray quips he is a novice when it comes to breeding Southdown sheep. There were stalwart breeders who had been there “forever” and from whom he had learned a lot since establishing his stud in 2006. Mr Murray said he had always liked breeding sheep and was interested in recording. His father-in-law, who had bred Southdowns, further encouraged his interest to venture into stud breeding. He had always been impressed by the breed, particularly its early maturity and ability to get lambs on the truck early. His stud ewe numbers had built up to about 240 and were run in conjunction with a total operation of just under 5000 stock units on 550ha, following the recent acquisition of more land. It was a hill country property and so it was a different environment from some areas where stud sheep were farmed, and had larger paddocks and gullies, yet the breed thrived. He sold 60-odd rams a year and with many being used for hogget mating, he thought he had better go back to that himself. Now two years into hogget lambing, it was “just so easy”, resulting in good lambs at weaning and a very saleable product. Last year, 40% of his works lambs went on the truck at weaning and a lot of those would have been Southdown-cross, he said. Southdown-cross progeny test lambs being graded by Miles Medlicott at weaning, watched by John Macaulay. That was where the real advantage of the breed was — “the ability to be gone” — and to yield at a variety of weights. Now breeders were trying to the breed “to the next level” and the establishment of a Southdown progeny test was about providing validation, he said. The progeny test, based at Simon and Kirstin Engelbrecht’s property at Stoneburn, near Dunback, was now in its second year and involved 20 sires from 14 breeders from Northland to Southland. The Engelbrechts did not traditionally use Southdowns but were interested in supplying breeding ewes for the programme. The couple were very successful commercial farmers, winning the Otago Ballance Farm Environment Awards and the New Zealand ewe hogget competition. Mr Engelbrecht was responsible for getting the ewes in the trial mated and the lambs on the ground. Lamb survival of the Southdown-cross progeny was excellent with less than 4% losses from lambing to tailing. 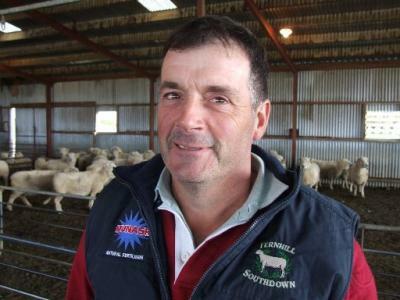 Lambs would then go to Southdown breeder Chris Medlicott’s specialist fattening operation near Waimate to be finished. One of the drivers of the programme, which is being supported by Beef + Lamb NZ Genetics, is Oamaru Southdown breeder and veterinarian Dave Robertson. It could be difficult for smaller breeds to get scale to get good performance recording numbers, Mr Robertson said. The solution was to have a progeny test where the environment was standardised. Objectives included getting better accuracy and reliability with performance recording, better genetic connectedness between breeders, comparing commercial meat quality traits within the breed, exploring some of the genetic technologies that were available for modern sheep breeding and looking at things like intramuscular fat and eating quality, and demonstrating the commercial relevance of the breed to industry. There had always been the perception that Southdown and Southdown-cross had good eating quality but one of the aims was to get numbers around that. 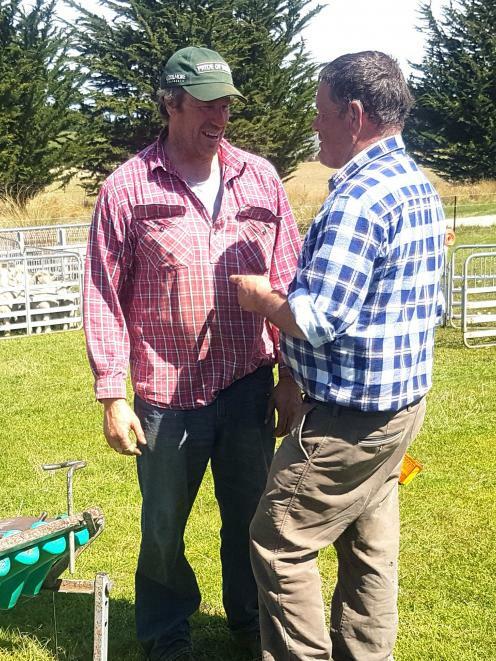 Stoneburn farmer Simon Engelbrecht (left) and South Canterbury Southdown breeder Chris Medlicott discuss the logistics of the Southdown progeny trial. “We want Southdown sires that produce lambs that grow fast, yield well and taste good — with the science to prove it,” he said. Traits other than production were also important to breeders, with the likes of structural soundness and feet still important to the breed. To be able to have a “snapshot into the future” of what a ram lamb could produce was very powerful. It removed some of the “guesswork and hoping something clicks” with a breeding programme. The next step was how to harness that information and it had the potential to change how genetics were chosen. Southdown New Zealand president Todd Anderson, of Winton, said the breed had continued to evolve over time to meet the requirements of the industry. The main focus was to maintain “killable growth’ — meaning that lambs were killable at any stage, from 14kg or 15kg if need be through to 25kg “or whatever”, Mr Anderson said. Breeders had a strong belief that it was not just about mass production, it was about quality of product. The only way for New Zealand to economically progress was to sell a premium product to people that had the means to pay for it. Part of that was that the consumer would want a story. The Southdown was one of the oldest sheep breeds in the world. And as far as meat quality was concerned, it was about grain, colour and marbling. Mr Anderson said the breed was the wagyu of the sheep world in some ways and produced “beautiful quality meat”. There had to be a conscious effort not to lose those attributes and so the instigation of the progeny trial was very exciting. 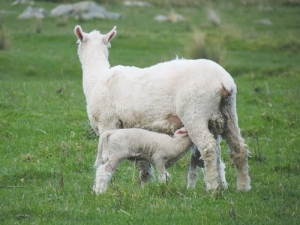 Carcass attributes, finishing ability, feed efficiency and killable growth were factors that were important to Southdown New Zealand as breeders, as well as to its clients in the sheep industry, if it wanted to be in that global niche market. New Zealand needed to realise that if it continued to sell based on commodity needs, then it would fast-track itself to the “bottom of the rung”. Southdown breeders had always been proactive in terms of embracing science, so that was not something new, while stockmanship was also an important aspect. The future — by continuing to maintain killable growth and a quality product for the consumer — was looking bright, but breeders also acknowledged they could not “stand still and rest on our laurels”, he said. 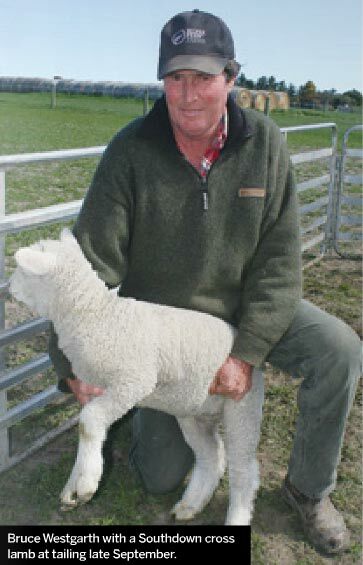 Veteran Southdown breeder John Macaulay, of South Canterbury, applauded the progeny test initiative. He watched last season’s lambs go through the process at Alliance Group’s Smithfield plant on January 31, almost 450 lambs weighing in at an average of 19.4kg. He was impressed with things in the cooling room, where the lambs were a “sight to behold”. Looking across at comparable lambs of other breeds, they were “all over the place with no uniformity”, he said. Ultimately, it was about growth rate, muscling and protein being produced as quickly as possible and the Southdown was one of the breeds that could do that. There were about 70-odd registered breeders in New Zealand and most were “totally dedicated”, which was one of the reasons the breed was performing, he said. Roger Tweeds runs 2300 Romney ewes and 200 hoggets on his 300ha farm near Lawrence, Central Otago. Tweed’s been 30 years on his present farm, a mix of river flats and steep country and typically dry in summer. 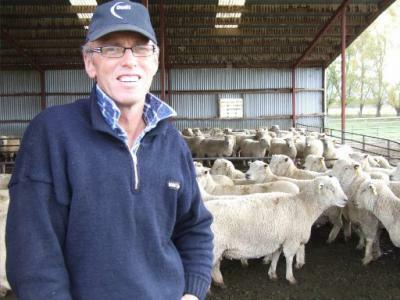 He’s experimented with a variety of terminal sires over the years, but has settled with the Southdown which he puts across up to 500 ewes in his B flock and all his ewe hoggets. Tweed says the Southdown makes for easy lambing and what he likes most is that the lambs grow well and come weaning time he has a good product to sell. He reckons with some other terminal sires he’s tried, while the lambing percentage was good the growth rate was not and that’s what counts! Tweed says this is especially so with the lambs from the ewe hoggets. “My place is steep and gets hot in summer. I notice that the Southdown rams and their progeny do well in this environment. I love the Southdown because they just keep on growing,” he says. He selects his B flock ewes based on how the animals look, not on their age. As for weaning, this depends on the state of the lambs. “The first lambs are generally weaned in mid-December, a mixture of those put to the terminal sire and those from the commercial flock. I don’t lamb an early mob as some people do. Tweed says the Southdown ram produces a “good meaty sheep” and he’s especially pleased with the lambs from the hoggets. He reckons the weight these lambs put on sets them aside from some other terminal sire breeds available. lamb at tailing late September. SOUTH CANTERBURY sheep and beef farmers the Westgarths run 4000 Coopdale ewes across two farms, one at 500m above sea-level on The Brothers range inland of Timaru, the other on the town’s outskirts. Nearly half the ewes on the 200ha down-country farm, which is run by their son Hamish and his wife Amanda are put to Southdowns, plus 300-400 at the 368ha Brothers property. Replacements come from Coopdale hoggets, 1250 of which were run with the ram last autumn, with 1000 scanned inlamb. Most have made marked improvements in recent years and the Southdown is no exception. The short, stumpy lambs prone to running to fat if taken too heavy are long gone. In their place are rams which throw a longer, leaner lamb that’s still solidly built and fast finishing. The growth of his Southdown x Coopdale lambs is rapid. Last year they started lambing August 22 and in the last week of November drafted 230, averaging 19.8kg. Admittedly, there were other breeds among them, but the Southdown at least held its share, if not more. Over the whole season, and all breeds, average kill weight was 20.3kg cwt. As a rule they’re shorn at 38kg and go on the truck at 44kg, all to Silver Fern Farms. WESTGARTH’S APPROACH to ram selection is simple: find good breeders, stick with them and reward them. His three suppliers are all from South Canterbury. The Southdowns come from Chris Medlicott’s Tasvic Downs and Clifton Downs studs; the Poll Dorsets from Steve McCall’s Castlerock stud, and the Suffolks and Coopdales from Peter Darling’s Coryston Stud. Westgarth points out better prices for the lambs isn’t the only benefit to early finishing: their mothers make better money as cull ewes. Space freed up on the down-country farm also allows more lambs and other stock to come down from The Brothers. With no irrigation, both properties can get dry. Again, fast growing, early finishing lambs are an advantage, in that more are gone before feed gets tight. Southdown rams ready for sale this summer. TALK TO commercial lamb producers using Southdown rams and you’ll find common threads running through all their comments, even if they are from opposite ends of the country. 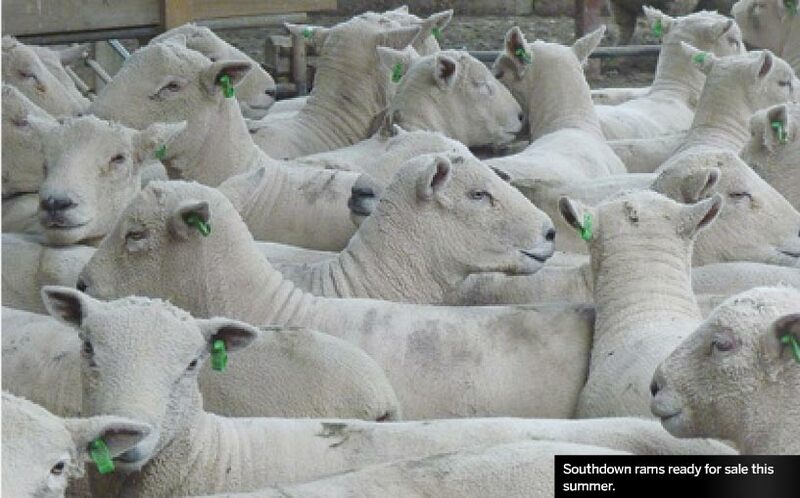 Southdown terminal sires are a key part of that early finishing strategy. He lambs in July, the Southdowns running with 1200 of a 3000-head Coopworth flock. This year he’s lambed hoggets for the first time, using Southdowns as the sire with 80% of 600 mated getting in lamb. “There have been no lambing issues with them. They’ve been spitting them out like a piece of cake,” he said midway through the hoggets’ drop. Down in Southland, Bill and Beth Gordon, Garston, are also keen to get lambs away early, albeit from much later lambing. “It can get quite dry here in the summer and if it gets dry, having quick maturing lambs means there’s more space for the Romneys,” notes Bill. That means better grown replacements and better condition in the 2200-ewe Romney flock, feeding through to the following year’s lambing result. Even if it doesn’t get dry, having the crossbred lambs away sooner means more feed to do something else with, such as fatten cattle, he adds. That’s from lambing starting the third week of September. He’s also using the Southdown across his hoggets. And while they don’t have the same coat as the purebred Romney lambs, there’s no problem with their vigour and survival as lambs, he adds. Unlike Bloxham, Gordon’s stuck with the Southdown as his terminal sire of choice through thick and thin – “since the mid 1970s” – but makes similar comments to Bloxham about how they’ve changed over the years. And in recent years the Gordon’s have had the competition results to prove it: three times they’ve had lambs in the finals of the Golden Lamb Awards at Wanaka A&P Show. Omakau Southdown breeder Donny Maclean with some of the sheep on display during a New Zealand Southdown southern tour. The Maclean family, of Omakau, will next year mark 60 years of breeding Southdown sheep. Don Maclean started the Bellfield Southdown stud in 1953 and the stud now encompasses 120 ewes. Bellfield was one of 11 properties visited during the New Zealand Southdown southern tour which was hosted in Otago and Southland last week. The property is farmed by Donny and Cathy Maclean, their daughter Kate, and Mr Maclean’s parents, Don and Win. All five contributed to the running of the farm, with a small amount of casual labour employed for lamb marking and haymaking. Bellfield was taken up in 1889 by Donny Maclean’s great-great-grandfather, upon his arrival from the Orkney Islands. The family landed at Port Chalmers, taking the train to Dunback and then walked to Omakau, a journey that took four days. Mr Maclean’s great-great-grandfather went blind on the ship on the way to New Zealand and so his two sons and a daughter led him by the hand on the long journey. The elder son broke his leg three miles from their destination. With some additions to the original property over the years, the Maclean family now farms 890ha, of which half is under flood irrigation and the remainder is unirrigated. As well as the Southdown stud, a South Suffolk stud was added in 1986 and a Dorset Down stud in 1992. The family runs 2150 crossbred ewes and 650 stud ewes, 670 crossbred hoggets, 165 stud ram hoggets and 180 stud ewe hoggets. They also run 1100 merino wether hoggets on the hill and 100 cattle. A lot of emphasis was placed on performance recording of the stud sheep, Donny Maclean said. “We want to know that we are able to present our clients with as much information as they require about the sires we produce. “They can go away happy in the knowledge that the rams they have purchased are proven to give them maximum returns for their farming business,” he said. Australian Southdown breeder Graeme Dehnert has been enjoying his first trip to New Zealand. About 45 people were on the tour, including some Australian visitors. Graeme Dehnert, from the Fernhill stud in Victoria, was on his first trip to New Zealand. 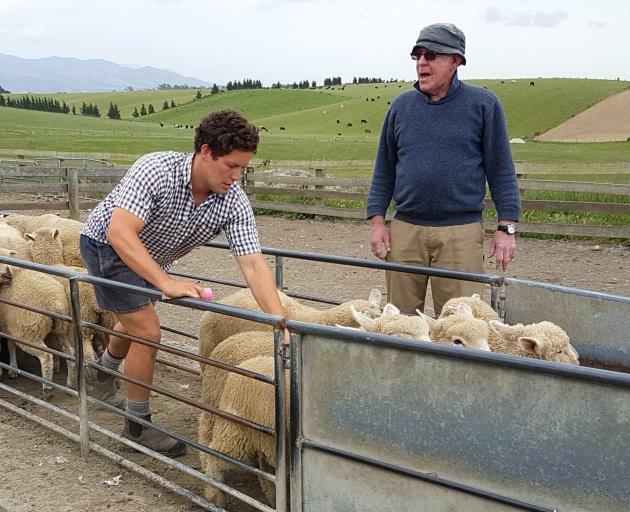 Last year, some New Zealand breeders visited his property as part of a tour and he decided it was an opportunity to catch up with people and see some sheep. He is also returning in November for the Canterbury A and P Show. Mr Dehnert has 180 stud ewes, along with a flock of commercial ewes, a cattle share-farming operation and some cropping on the 400ha property. The Southdown stud was established by his father in 1930 and the breed was “in the blood”. He won champion Southdown ram at the Royal Melbourne Show last year. Southland Southdown Breeders Club chairman Rob Hall believed the breed was in good heart in New Zealand. Describing it as “go-ahead”, he said there was a lot of potential, especially for breeding early lambs. Getting lambs away early was “money in the bank”. Ram sales had gone well this year and it was encouraging to see some new studs being established. The first Southdown stud flock in New Zealand was founded in 1863.